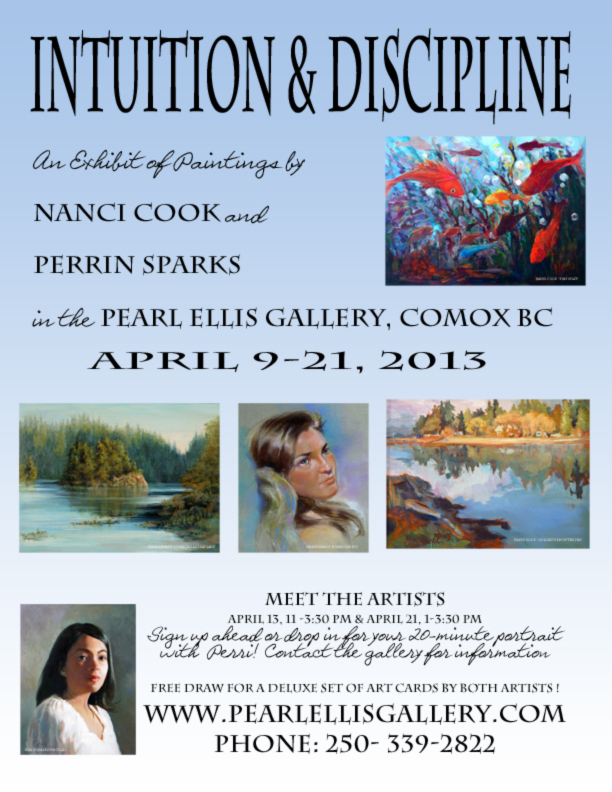 Quadra Island artists, Nanci Cook and Perrin Sparks present “Intuition and Dicipline” April 9-21 at the Pearl Ellis Gallery in downtown Comox,highlighting the diversity in approaches to their art. Perri initiates much of her work with the discipline of a medical illustrator, while Nanci responds to her subject matter more impressionistically, yet their paintings viewed together portray a delightful, exhibit of subject, style, and personality. The gallery is open Tuesdays-Sundays but please stop by and meet the artists Saturday April 13 11 AM- 3:30 PM, and Sunday April 21, 1-3:30 PM. Perri will demonstrate some techniques with 20-min portrait sketches for $43 each–drop in or call ahead to schedule a slot with her on the 13th or the 21st.